Sometimes we do things in a traditional way because, well, that’s what everyone is doing so it must be the right thing to do. Sometimes it is. But then sometimes you decide to try a different way, it works, and you ask yourself, why in the world did I work so hard all this time, following the traditional method. That’s how it is with traditional soil preparation. Why they teach us we should “work” the soil before planting I have no idea. Mr. Soil doesn’t want us to poke around, I assure you. Exposing Weed Seeds to the Sun – some people till their garden to get rid of weeds. By doing that, they actually make the problem much worse because now, not only they mixed the new weed seeds in the top layer of the soil, they also bring dormant weed seeds that were buried deep in the soil to surface level, exposing them to the sun and allowing them to germinate. Disturbing Earthworms and Other Organisms – imagine you are a hard working earthworm. You dig beautiful tunnels so the roots of plants will have oxygen, you eat bad soil and poop good soil, you eat decaying plants and poop compost, you make sure the compost can find its way to the root level of the living plants in the garden, you interact with other organisms, you make babies and teach them how to work hard for mother nature… You know, you’re living a good life in your natural environment. Then one day a scary machine with huge teeth enters your home and ruins the place. It’s an earthquake, a hurricane, a tornado, all your hard work is gone and you have to start again, that is if you can still find all the parts of your body. Loss of Nitrogen – many crops leave nitrogen behind, which is very beneficial to the following crops. Tilling the soil can cause the release of this nitrogen into the atmosphere as nitrogen oxide, a highly potent greenhouse gas, or can cause it to drain into waterways. Erosion – if done regularly, tilling can cause the soil to erode. Poor Water Retention – tilling reduces the amount of water the soil can retain. Hard Work and Expensive – a good tiller might cost between $400-600, money that will be much better spent on good compost or mulch. And those machines are, simply put, not much fun to work with. This is a small garden space I have to the left of our front steps. I shared with you here, a few months ago, how I turned it into a vegetable bed. Last fall I planted peas (to add nitrogen to the soil), green onions, and many carrots here (to open up the soil). I just recently harvested the last of them, and since we are getting closer to spring planting, it’s time to prepare this bed. So first, I removed the stepping bricks. 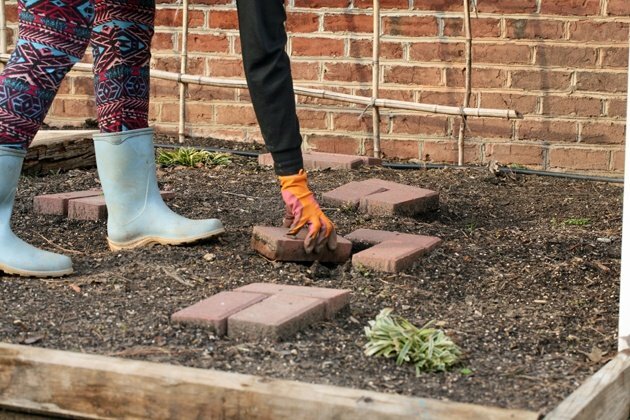 This is an odd shaped garden bed, and I can’t get to all the vegetables from the outside, so I place the bricks to make sure I don’t step on the plants and that I always step in the same spot. Next, I added some soil on top of the existing soil. This is a new bed and last year we didn’t fill it with enough soil, so I added about 6 bags of soil this year. I use the basic soil from the garden store because I grow organically and I don’t want the fertilizers they add in the garden soil. 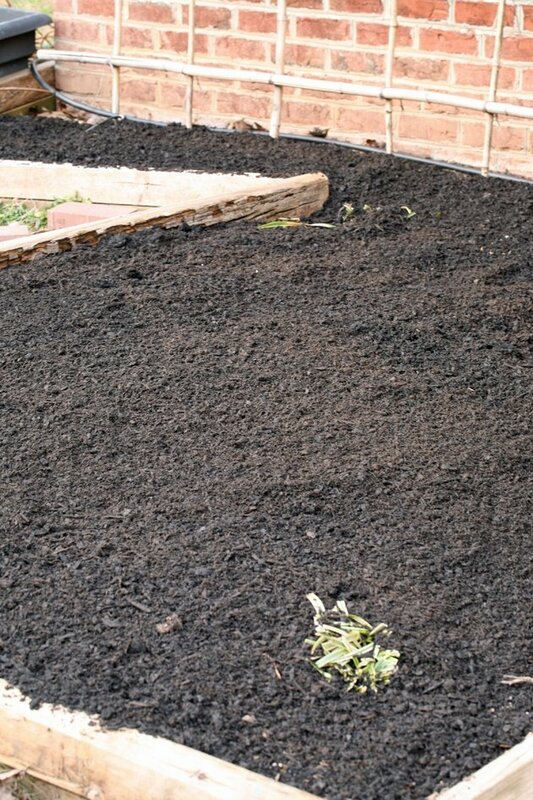 If you have an established garden bed, you will find that every few years it might need additional soil added to it. 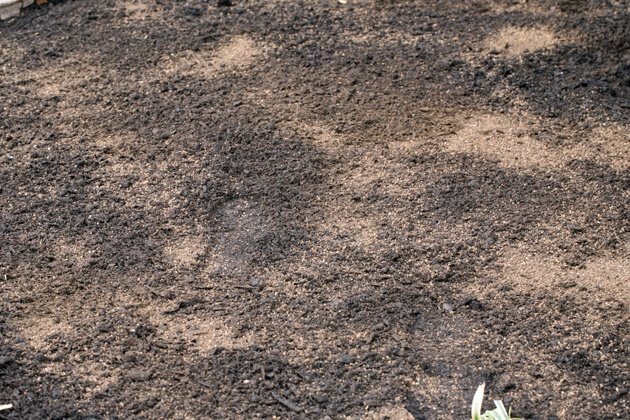 At the end of this post, we will talk about how to start a new no-till garden (on a lawn, for example). Next I added compost. The more the merrier. I used composted cow’s manure that I bought in a bag because my own compost is not ready to use yet. And spread it evenly all over the bed. I love Espoma. I added this Garden Tone at the time I prepared the bed because I am going to plant in it shortly, but you really supposed to add it at the time of planting. Read the instructions on how much to use on the back of the bag. Then just spread it on top of the soil. Water, worms, and other organisms will carry it down to root level for you. 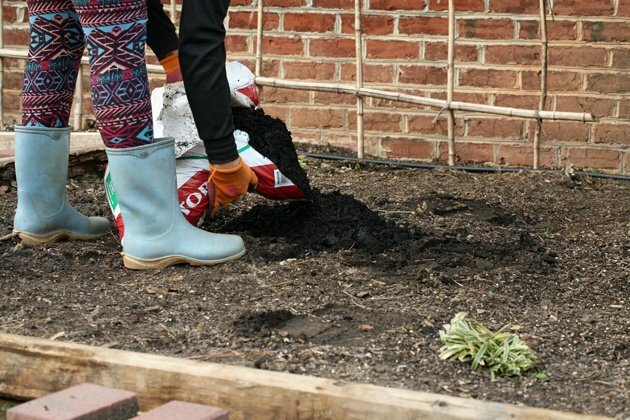 You don’t have to do this, especially if you added a lot of good compost, but since this soil is new, I wanted to make sure my vegetables have enough to eat. Mulching is a very important part of no-till gardening. You can use dry leaves, wood chips, grass clippings… But my favorite is straw. 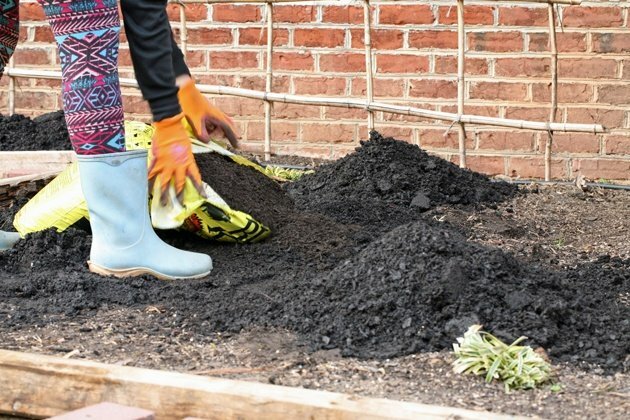 Mulch keeps the soil moist and soft, it eliminates weeds almost completely, and it’s composting right there in the garden, providing your plants with food. It’s a pain in the you-know-where at planting time, if to be honest. You have to move the straw, plant, wait for the plant to germinate, and bring the straw back around it. In very large gardens, it makes it very hard to use a seeder, but for small gardens, where you plant by hand, mulch is great. With straw, a layer of 6”-8” is a good start. 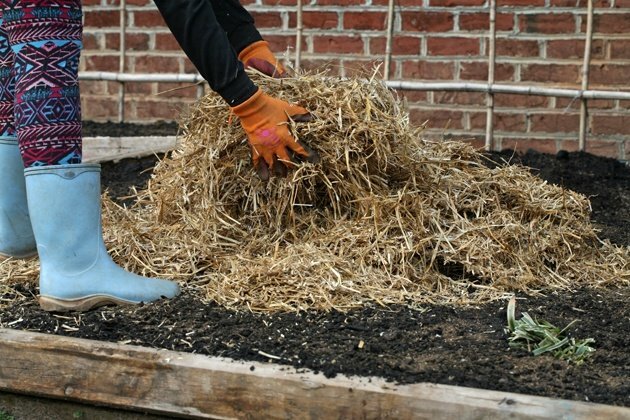 The straw breaks down and turns into compost right there in the garden, so you will have to keep adding straw once in a while. Lastly, I placed the bricks back in place. From now on there is nothing else I have to do besides planting, harvesting, and adding straw (there might be a few weeds here and there). 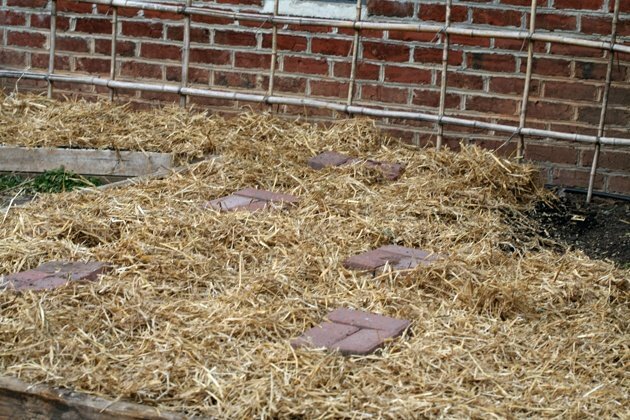 You can move the straw back at the beginning of the season or in the fall and add more compost if you like, but since the straw is turning into compost, you’ll find that your plants are doing great even if you don’t add compost. It really is the easy way to garden. And you should move the straw back once in a while, stick your fingers in the soil and feel and see how amazing it is! Your first step will be to cover the area in the fall. You can do that with a black greenhouse film (you can buy those at your local farm supply store), or, an even better way is to cover the area with an old carpet. The carpet won’t let the sun through and it is also heavy, whatever is under it is not going to live for long. You let this be for the winter and in the spring, you pull the film or the carpet off. If there is still too much dead grass or maybe too many dead weeds that didn’t break down you can remove them by hand or with a hoe. Then do the same thing I did with my small garden space. Add compost and soil, about 8”. Add some organic fertilizer and cover with straw. You are now ready to plant! Last year, I tried gardening for market. I set up 66 30′ x 30” garden beds and I thought it will be the easiest to do the same even on a large scale. So I purchased many bales of straw and mulched all of my beds. It turned out to be very hard to maintain my large garden. It took a lot of time to move the straw so I can plant with a seeder, and since the space was so large and I only could afford so many bales of straw, I ended up mulching only 3” or so and many many weeds still found a way to grow. Anyway, I was thinking back then that maybe this is the reason you don’t see many large farms use mulch. I know there is still a way to make this work on a larger scale (watch Under Cover Farmers if it interests you), but for the small home garden, I really don’t think there is a better way. 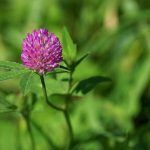 No-till gardening is so simple and easy, and you will notice in the first season how much your plants love it. 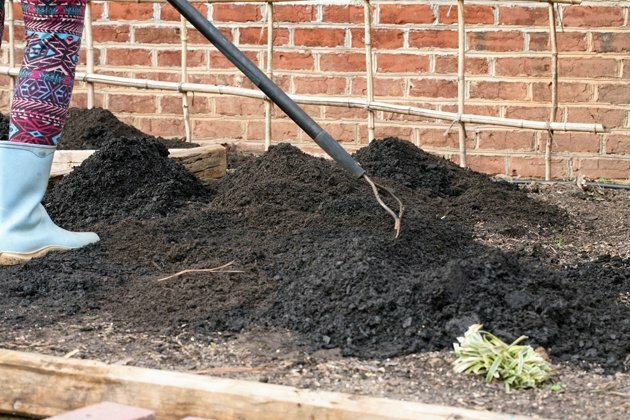 I would love for you to comment bellow and let me know how you prepare your garden soil before planting. 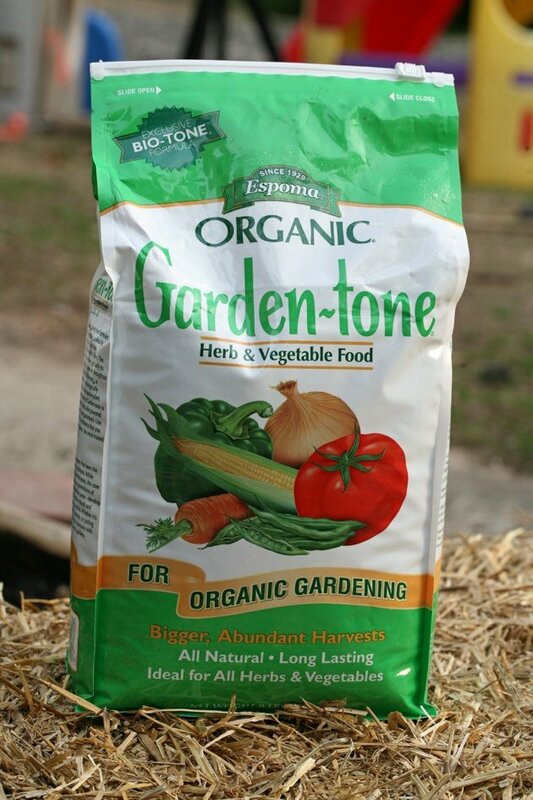 I am quite excited to try, at your suggestion, the no till type of organic gardening method. This will be wonderful, as we do not have a tiller. I have put in garden for about 8 years now. A kind neighbor has usually tilled for us, when he had time. No I won’t have to wait for him. I can do my planting, as I choose. I also didn’t know just how to prep the soil & you’ve helped with that, too!! 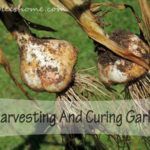 I really am anxious to get out in the garden and try your proven method! I always say, work smarter, not harder! looking forward to the results for us. Will this method work well for flower gardens, too? Thank you for inspiring me to, go play in the dirt!! Yes Linda! It will definitely work for flowers too. I have a bulb garden that is done the same way and the weather here in NC is getting warmer so my bulbs germinated last week and starting to flower. I also have a herb garden that is done the same way. With herbs, it’s even easier because you plant them once (rosemary, thyme, mint etc…), and the only thing you have to do is keep adding mulch around the plants. The only downside with using straw as mulch is that sometimes you land on a bale that has a lot of seeds and they germinate. But it’s no big deal weeding them. Good luck, let me know how it worked. I worry the straw becomes wet and compacted I planted garlic in the fall and the straw seemed to clump and smother it. Do you mix periodically the straw so it dries some? No, I don’t mix it with anything. Actually, one of the benefits of mulch is that it keeps the ground moist. However, I will tell you this, last year I planted garlic in straw mulch and it didn’t work. Not because it clumped it but because it was too wet for the garlic and most of my garlic rot before I could harvest it. Maybe wood chips will work better with garlic, I am not sure but the straw definitely kept it too wet for my garlic (I guess it also depends on how much rain you have). 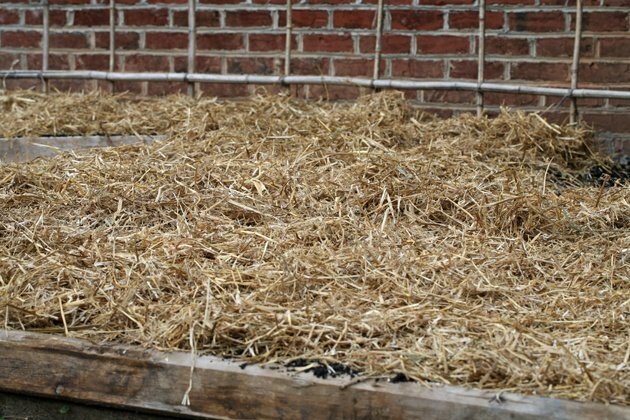 I really want to use straw but how can you be certain it hasn’t been exposed to any pesticides or chemicals which will then go into your soil, and then veggies? To my knowledge, most wheat crops are sprayed with two main kinds of pesticides: 2,4-D and Harmony. Both of those have a half-life of less than 14 days, meaning it takes them less than 14 days to break down. Usually, farmers will not harvest during the 30 days after spraying. So by the time they harvest the chemical is long gone (don’t forget most wheat crops that are baled are meant to feed livestock). The straw I use is probably a few months old, whatever chemicals it had on it are long gone so I feel it is safe to use it in my organic garden. It’s great if you can find a local farmer to buy from and ask them exactly what they spray with and when. Then do a little bit of research on this chemical before you use their hay/straw. Fun post. I found you via pinterest of course. ? we were late to the game and covered our grass with thick cardboard that covered some furniture we got from Ika. ( only About a month ago?) Have you watched the Back to Edwn film? That’s how we heard of no tilling. You should look it up. You can watch the film free on their site. This is our first garden on our own and I am so excited! I am in utah and hoping the random wind storms don’t blow our covering away. (Used to live in NC btw. I made a garden with my dad about 8 years ago and did the tilling etc. It was horrible in that clay. I wish I had known about this back then. Yes, I watched the film. His garden looks amazing. I tried to find a source for free wood chips here but still have no luck finding one. Straw is much cheaper and does a great job too so I use it instead, but it’s the same concept. The only problem with the straw is that sometimes it has seeds inside that germinate and you end up with a small feild of wheat. It’s not too hard to pull the wheat, just annoying. In our city we have huge piles of free mulch from Christmas tree recycling and the city trimming trees. You might be able to find wood chips through your city and\or county website? The paragon of unatrsednding these issues is right here! Can I plant in the garden right away, or do I have to do this a couple months ahead of time? You can plant right away. Hi there! Interesting take on no till gardening. I agree with you on not using the tiller and even the methodology behind no till gardening. But it stops being organic when you put down fabric or a rug to cover ground before laying down your soil. Just use gold old plain cardboard and over lap the entire area to be planted, wet it down thoroughly, next cover with newspaper, not glossy inserts just newspaper, wet that down thoroughly, repeat rach one more time. Then if you have mulched leaves place those all over newspaper, if not pinebark fines or pinebark mini nuggets can be spread around, then add your soul/compost mixture and them mulch the top after you plant. Straw can act like a warm home for mice in the winter months and they love brand new roots to munch on. Never had trouble with pine bark though. All of the materials I listed breakdown naturally and create ” black gold” it’s truly amazing and the plants thrive. Not being critical but to have an organic garden, you need to be sure all the materials are biodegradable and replenish the existing soil with nutrients. The fabric is horrendous on plant roots and will tear them to shreds. Do away with the fabric and save yourself the added aggravation. The stepping stone bricks are a fabulous idea to get around to your plants and harvest your bounty! I never had a problem with mice in the hay. I love how it is decomposing so fast and how it keeps the soil moist, but lately, I started to be a bit concerned about the chemicals they spray the hay with and what it might do to my plants. I would love to use wood chips but my garden right now (we moved since this post) is too big to cover with wood chips that come in bags from the store. It will be too expensive. I am trying to find another source for wood chips in the area. Hopefully, I’ll be able to find one. If i read her post correctly she took the old carpet OFF before potting down the mulch, etc. I live in NC also. Western part. Some of the cities offer free mulch. Hickory does anyway. It’s not ground as much and you have to let it compost some before using but I’m sure it will work. Hope you can find a source. Yeah, someone mentioned it to me in the past. I need to call around and check. I tried our county, but they don’t offer wood chips. Also, someone told me that the electric company might offer them when they clean tree branches around wires. I tried calling several tree trimming companies to see if they gave the shredded mulch away for free. One company said they had a tree trimming in my area and they delivered it to my driveway free. That is awesome! We have a couple of services like that but they only deliver if you are in the city. We are too far out in the country for them. They won’t come all the way here. I am so excited to try this! My son actually owns a tree stump removal business and I imagine he would be thrilled to give me his wood chips, as he has to dispose of them after each job! Thank you so much for all the information! I called so many tree cutting businesses around and no one is willing to drive by here and give me their chips 🙁 I use hay right now. If you have a truck maybe you could drive there and they would dump it in your truck. Just a thought. About nitrogen leaching of wood chips: another video claimed that this only happens if you put the wood chip[s deeper in to the soil, or plow them in. If they are simply placed on top,this doesn’t happen.